Any type of water leak in your home is a genuine issue if left unattended. When quickly discovered and repaired, you’re likely going to avoid costly repairs and headaches. A slab is no different. While certainly considered one of the more expensive repairs homeowners may experience, if caught early enough, the issue can be alleviated. 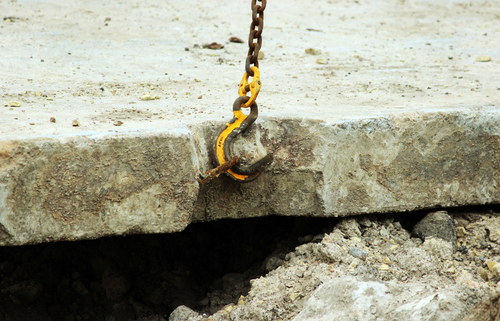 A slab leak occurs when a water supply pipe or drainage pipe running through the concrete breaks, cracks, or bursts. The leak itself does not occur in the concrete slab, but rather in the piping encased in or underneath. In any case, a cracked or burst pipe may cause severe foundation damage. Typically, leaks occur due to wear and tear, corrosion, higher water pressure, or improperly installed pipes. Any type of foundation may spring a leak, even those built of poured concrete. When this happens, prompt repairs are the only solution. The longer you wait, the more potential damage you’ll incur. First, we need to find the source. Once the source of the leak is located, repairs may be implemented promptly. Re-piping – This repair solution is often required when multiple leaks occur. Re-piping is typically enough to permanently stop leaks, though the option does require invasive cutting into the floors and concrete slab. Relining – Relining is a worthwhile option, depending on the size of the leak. A new liner may be pushed through the broken sewer pipe, covering any breaks and effectively sealing the leaks in place. To schedule slab leak repair services, contact Emergency Plumbing & Solar by calling 808-691-9309. We’ll find a permanent solution that works! Slab Leak Overall rating: 5 out of 5 based on 10 reviews.